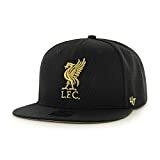 The LFC Black Beat Box ’47 CAPTAIN has a structured crown with an adjustable snapback and a flat visor. This style is made from a soft mesh with raised metallic gold embroidery on the front. This entry was posted in Liverpool and tagged Beat, Black, CAPTAIN, Liverpool, Official by Footy Star. Bookmark the permalink.